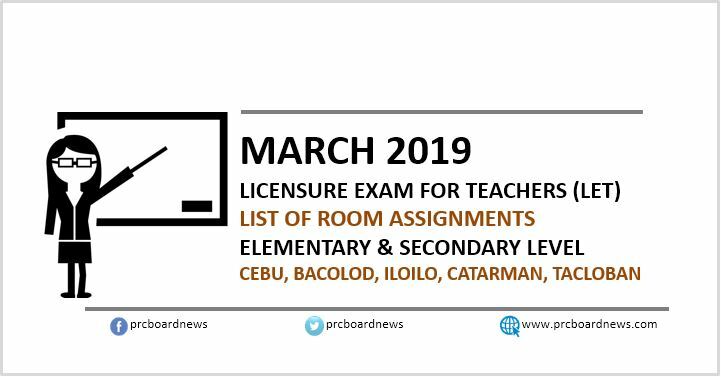 MANILA, Philippines – The Professional Regulation Commission (PRC) announces room assignment and instructions for March 24, 2019 (Sunday) licensure exam for teachers (LET) or teachers board exam. View on this page for the list of room assignments for Cebu, Bacolod, Iloilo, Catarman, Tacloban test centers. LET is among the licensure exams with huge number of takers. In the same period last year, 58,323 Elementary Education graduates and 76,673 for Secondary Education tried to hurdle the board exam. Aside from Catarman (Northern Samar), Cebu, Iloilo and Tacloban, the March 2019 teachers board exam will be administered in Bacolod, Baguio, Rosales, , Legaspi, Lucena, Manila, Occidental Mindoro, Tuguegarao, Pampanga, Cagayan de Oro (CDO), Davao, General Santos and Pagadian and Zamboanga. 1. Examinees should report before 06:30 in the morning every examination day. LATE EXAMINEES WILL NOT BE ADMITTED. PRC Board News will also update this website for the results of March 2019 LET. Keep tuning in and good luck to all takers!